Good morning, Julie. Would not miss this extra-special edition of Dark Night for anything. Hello, dark nighters everywhere. This means you, Euro people. Good Morning Julie and Local Celebrity Gaylord fields. Morning Julie and Gaylord by the way. Where are my manners? God Save the Kinks ! Hi everyone! I'm at work, so I'll be listening sporadically, but it's sounding great so far. Hard to believe it's 50 years old. Just turned 50 myself even harder to believe. Hi Julie--and hi Gaylord! Love the Kinks, love these Kinks shows, glad that when I finally get a moment (and good nuff Wifi) to check in here, I land on this special episode! heya Matt! Staying up for this huh? In GMT+1 land, I actually woke up at 9 for this! :) in Frankfurt right now, returning to the States and GMT-5 land on Sat. - that is of course amazing - especially the Village Green segment ! Did the 60s really happen? HIya, the Matt! P-90, another in a series of late nights, I guess? Loving all of this, Julie. No Isadora dancing for me...this scarf is too long, and dangerous. Yes! You can def do The Swim to this! C'mon and Swim! Fake Beatles w harmonica, or Fake Stones?? interesting, who invented quiet loud songs? I never wondered that before, hmm, wondering .. YES, early Kinks and Glam Suzi work well together! there are mountains made of possums? The Beatles were not lower-WorkingClass! They lived in semis! Hello back to the Newe World, from the Olde! Wicked Annabella! This was a very "ahead" song for the time! 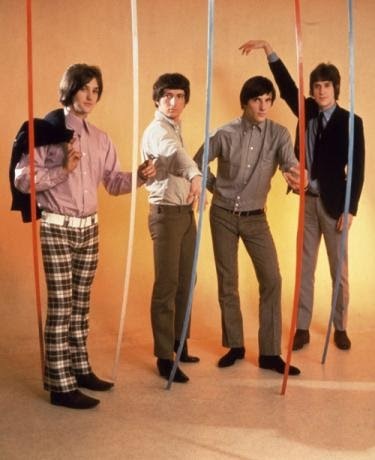 @RRN63 A blessing in disguise, the Kinks became the truly "British" British Invasion. Another astonishing song for '68: "God save little shops, China cups and VIRGINITY!" Julie, just curious: to what other artists would you dedicate your entire show? There can't be that many so deserving. I did Kate. I've been considering doing Floyd. I could do the Moodies..I'd like to do that with Frank O'Toole. Good morning Julie & Gaylord! Amy Annelle has done a great acoustic version of "Too much on my mind". God Save the Peripatetic Neologists. Lots of prescient insight, Gaylord. Good stuff! That warm shower was hard to leave...... Oh it's not winter yet! I'm doomed! But you don't what'll happen! When I came home tonight I was all wet and cold, couldn't get warm. New stuff for me. Appreciate the education. Low Budget is another really good one.. It wasn't until the late 80s that things got less interesting for me, round the time of Think Visual. Good morning, Julie & Gaylord. I saw Ray Davies at The Chance in Poughkeepsie in the mid-90s. This show is great. But Bonjour Julie and friends ! <---- and enter your pet as mascot! I don't remember this song at all, and I played the hell out of this record. I just saw the playlist and had to check that Ray Davies hadn't died. This is my new favorite FMU show! It's not usually like this, cgm hope I don't disappoint you! We're already talking about doing a 4th Kinks show..next year I guess! Something tells me Julie loves the Kinks. Kind of "Riki Tiki Tavi-ish" rapped segment. Very little can compare to Julie and Gaylord warbling Shangri-la together. Gotta love free form to pieces. Having a lot of fun listening, thanks both of you! Dammit, slept in and missed the show! Thank heavens for the archives. This has been so much fun..thanks for listening everyone! Morning Caryn! This is an Archive I want to return to as well! It was great to listen to while getting ready here but couldn't hear parts over the shower! Thanks so much for another amazing Kinks show, and thanks Gaylord for coming in so late! Looking forward to the fourth one already! Glad there are more Kinks songs for future shows. Have a good week. Looking forward to the next special. Hi Julie & Gaylord! What an incredible show! Can't wait to catch the archive! God save The Kinks! Utterly agree w/ both your picks from "Kinda Kinks" as well as your reasons for each! "Tired of Waiting" was, IIRC, the very first record I bought on my own. @Julie & Gaylord: An archival delight -- thanks! Re: your harpsichord discussion: I believe they still have kits reasonably priced where you can put together your own. But you can also get a decent simulation from various synth keyboards. I use either a Korg or a Yamaha for my own harpsichord-backed tracks, and the latter keyboard is only $150 or so. I love punk rocks drunken dads!!!!! !